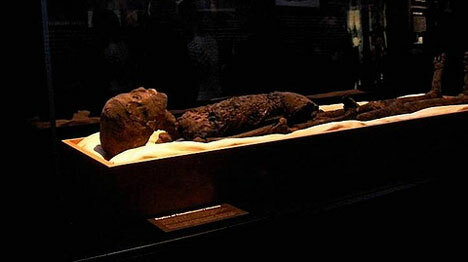 Since the discovery of King Tut’s spectacular mummy in the 1920s, one of the principal problems involved with studying the boy king’s remains has been doing so without destroying the mummy. 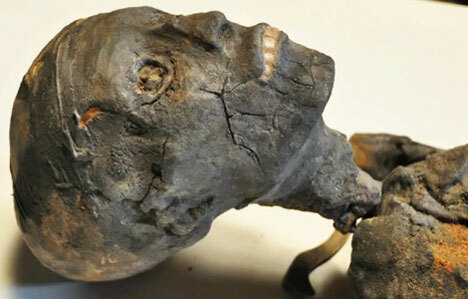 3D printing recently made it possible to study Tut without degrading the ancient king’s body. A perfect King Tut digital replica was created using detailed CT scans of the 3,300 year old mummy. Then came the truly sci-fi part: an exact copy of the mummy was built layer by layer in a 3D printer capable of printing objects up to 6 feet long. Then the copy was given to Gary Staab, a prehistoric life modeler who added texture and color to the replica to make it look exactly like the original. The “cloned” king is accurate enough to be displayed in an exhibit showcasing both the prototyped body and a selection of artifacts from the boy king’s tomb. The high-tech nature of the display mummy is completely hidden by its truly ancient appearance. See more in Futuristic or under Technology. October, 2010.